Oval bowl; variegated agate, light red, lilac, etc. ; mounted in enamelled gold; radiating acanthus leaves and square tabs in low relief; gold mount on lip, engraved with detached scrolls filled with black and coloured enamels; mount wanting on foot. Origin: Milan (workshop of the Miseroni family) or perhaps Prague (workshop of Ottavio Miseroni), beginning of 17th century; later enamelled gold mount. Commentary: In Read 1902 it was recognised that the bowl and the mount did not seem to belong together, for it was stated that “the mount is German, the bowl French, 16th century”. This attribution was repeated in Dalton 1927, but it is not clear if any doubts about the age of the mount were ever entertained. Furthermore, as no comparable item of hardstone carving with a fully documented French origin has yet been published, it is necessary to re-examine the evidence in the light of the more recent studies in this field (see R. Distelberger, Beobachtungen zu den Steinsechneiderwerkstätten der Miseroni in Mailand und Prag, ‘Jahrbuch der Kunsthistorischen Sammlungen in Wien’ vol. 74, 1978, pp. 79-152). The extremely high quality of the workmanship that distinguishes this beautiful oval bowl suggests that it belongs to that small group known to have been produced by the Miseroni workshop, either in Milan or in Prague, early in the seventeenth century, most of which have been preserved in the Hapsburg Schatzkammer in Vienna. The subtle and highly inventive reliefs carved on these hard-stone vessels, often under the direct patronage of Rudolph II, were rarely, if ever, repeated - each one being an original and very individual achievement in the Mannerist Court style. Nevertheless, the essential elements that give the low-relief decoration on this bowl its very particular character can be perceived, in part, on several extant Kunstkammer objects: for example, in the earliest form it appears on the tall covered vase of heliotrope by the Miseroni of Milan (in the Medici collections, Pitti Palace, Florence; inv. no. 711; Kirsten Aschengreen Piacenti, ‘Il Museo degli Argenti’, Milan, 1967, p. 139, no. 207; A. Morassi, ‘Art Treasures of the Medici’, trans. By P. Colacicchi, London, 1964, p. 26, col. pl. 327; E. Kris, ‘Meister und Meisterwerke de Steinschneidekunst in der Italienischen Renaissance’, Vienna, 1929, pp. 88, 186, no. 553) and on the Milanese smoky-quartz covered amphora (in the Treasure of the Dauphin, Museo del Prado, Madrid; Inventory of 1776, no. 137; D. A. Iñiguez, ‘Catálogo de las Alhajas de Delfín’, Museo del Prado, Madrid, 1989, p. 164-5, no. 101, col. pl.). However, it subsequently appears in a far more comparable form on several hard-stone vessels from the Imperial workshops in Prague: for example, on the Vienna Schatzkammer's heliotrope shell-shaped bowl, which was most recently attributed to the Miseroni workshop in Milan c. 1600 (inv. no. 6865; see R. Distelberger, in ‘Prag um 1600: Kunst und Kultur am Hofe Kaiser Rudolfs II’, Kunsthistorisches Museum, II, Vienna, 1988, pp. 225-6, no. 692) and on a smoky-quartz covered bowl - with later mounts - preserved in the Bayerisches Nationalmuseum, Munich (inv. no. R. 2149; see R. Distelberger, in ‘Prag um 1600’, I, Vienna, 1988, pp. 481-2, no. 359, where it is attributed to the Milan workshop of the Miseroni at the beginning of the seventeenth century). This latter piece combines the acanthus foliage at one end of the bowl overlapping the square-ended tongues and the round-headed gadroons, even though these motifs have all been used in a highly individual design to create a different effect. The former piece has, in addition to certain similarities in low relief on the underside of the bowl, an exactly comparable form of low, oval base, though its vertical foot-rim is still hidden by its silver-gilt mount. However, the low-relief motif of the square-ended tongues with a small semicircular nick and tapering sides arranged in a radiating and graduated manner is repeated exactly on both the cover and the bowl of 'jaspachat' that was formerly in the Kunsthistorisches Museum, Vienna (inv. no. 1869) and is now in a private collection (see Distelberger 1978, p. 113, fig. 88, where it is attributed to the Milan workshop of the Miseroni, c. 1600, and its measurements are stated to be 13.2 x 19.3 x 10.9 cm). du Louvre, inv. no. MR. 175). This magnificent piece is also reliably attributed to Ottavio Miseroni's workshop in Prague at the beginning of the seventeenth century, and it may be compared with one further standing-cup in the Galerie d'Apollon (Louvre, inv. no. M.R. 149), which is again carved with these square-ended tongues; they appear among the scrolls at both ends of the bowl, while a shell motif is used, on either side, in the middle section of the bowl. Both these standing-cups from the French Royal Collection are closely related to the bowl in the Waddesdon Bequest and help, therefore, to confirm its attribution to the Miseroni workshop (either in Milan or possibly in Prague) soon after 1600. Consequently the gold mount on the rim of the bowl has to be assessed within that context; fortunately there is sufficient reliable comparable material, especially in Florence and Vienna, to establish beyond doubt that the enamelled decoration on the mount is not only greatly inferior but essentially different from the documented material - for example, the gold mounts enamelled by Jan Vermeyen in Prague about 1602, which decorate an opal bowl that was no. 1470 in Rudolph II's Inventory of 1607-11 (see R. Distelberger, in ‘Prag um 1600’, II, Vienna, 1988, p. 238, no. 712, col. pl. 27). 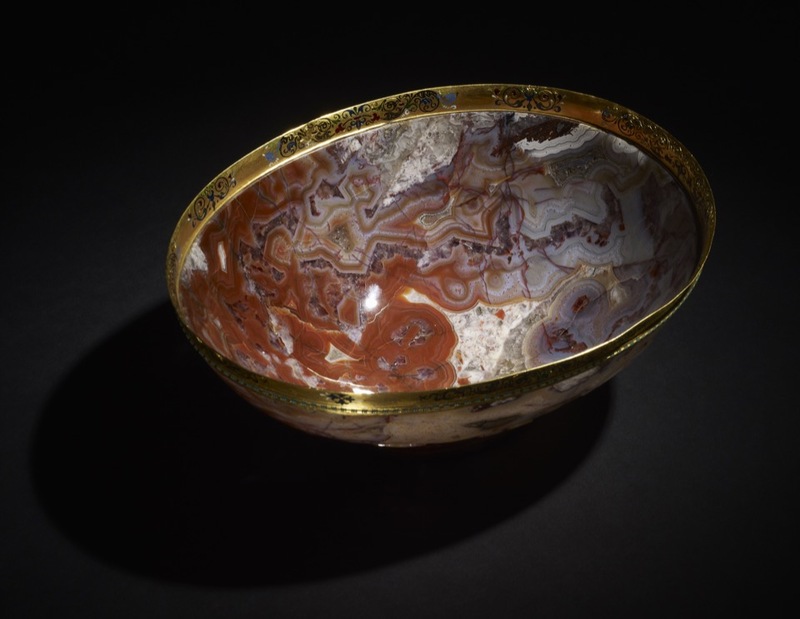 It seems, however, that the agate oval bowl's rim-mount may be based on a slightly earlier type of mount, such as that used around 1580 for the famous rock-crystal 'heron' cup in the Medici collections in Florence (see Piacenti 1967, p. 139, no. 213, col. pl. 22). On the 'heron' mounts, the thin, black enamelled lines of the continuous running scroll are interspersed with small blue enamelled flowers, touches of white and so on, but, despite its curling flourishes and excessively finicky detail, its design incorporates neither the floriated crosses nor the stiff flourishes that project outwards at the beginning and end of each of eight large scrolls - features that give the London bowl's mount such an immediately unconvincing character. A close examination of the composition of both the large and the smaller scrolls reveals a pedestrian, almost lifeless, repetitive quality that so often characterises the pastiches of the nineteenth-century copyist. Although many such deceptive mounts are now identified as the work of Reinhold Vasters (1827-1909), not all of them were made in Vasters' Aachen workshop - and, indeed, this mount might have been produced earlier in London or Paris - perhaps during the second quarter of the nineteenth century. Hugh Tait, 'Catalogue of the Waddesdon Bequest in the British Museum. III. The Curiosities', British Museum, London, 1991, no.16, figs. 219-222.